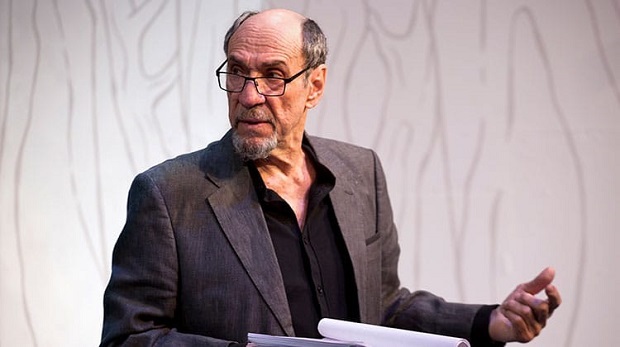 There’s real pleasure in being able to see an actor of the calibre of F Murray Abraham on the London stage. Depending on your cultural references, you may know him as the shadowy Dar Adal from the TV show Homeland, or the Oscar-winning Salieri from the film Amadeus, either way he’s a hugely appealing reason to make your way to the Vaudeville Theatre to see him in The Mentor. Laurence Boswell’s production of Daniel Kehlmann’s play originated at the Ustinov studio at Theatre Royal Bath, from whence European modern classics like The Father have sprung, and it is clear that they are aiming for similar success, even employing the same translator Christopher Hampton. And if the play never quite scales such heights, it is still a diverting new play. Abraham plays Benjamin Rubin, a highly cantankerous writer who has been brought in as a mentor for a younger playwright who has been tipped for great things on the basis of his first play. Thing is, Rubin was similarly celebrated for his first work and never quite managed to live up to the promise so his interests lie mainly with the cheque he’s getting to salve his insecurities. But when he meets Martin Wegner, an excellent Daniel Weyman, he can’t help but be sucked into a petty battle of egos as he tries to resist the arrival of the new guard, to defend his long-faded reputation, to prove that his is the more superior opinion. Whether denigrating Wegner’s book or trying to seduce his wife, Abraham is superb at playing the hollow arrogance of a man who clings to luxury as if it validates him entirely. Boswell ensures there’s a strong comic bite to the play but it is short and somewhat lacking when it comes to its supporting characters. The superb Naomi Frederick is severely underused as Martin’s wife Gina, who has her own role to play in reassessing critical reputations, and Jonathan Cullen also has little to do as the arts administrator and would-be artist who has set up the mentorship. As sharp and funny as the writing here is, it never feels important as the caustic wit comes at the expense of credible characterisation – one never really cares about what is going on in the world of the play and given its lapses into pretentiousness, it doesn’t feel that the characters care either. Still, seeing F Murray Abraham is a real treat and an opportunity you might well want to take up. 4 July 2017 - "a diverting new play"